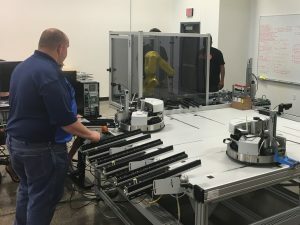 (RED OAK) – Texas State Technical College’s Logistics Technology program recently received a manufacturing operations training system through a Texas Workforce Commission grant. The $235,000 equipment will be used by students taking Introduction to Materials Handling, Materials Requirement Planning and Warehouse and Distribution Center Management for the Associate of Applied Science degree in Logistics Technology. Students will learn how to turn the machinery on, troubleshoot and operate the system. Scott described the machinery as a new experience for students. TSTC is poised to meet increased logistics demands in Ellis County. Some of the jobs that Logistics Technology graduates can pursue include purchasing, warehouse dock management, dispatching and inventory control. Logistics and distribution is one of the city of Red Oak’s target industries. National Freight Industries has at least 70 employees working in logistics and warehousing at a 60,000-square-foot facility on Bowie Drive, according to the city’s economic development office. Lee McCleary, Red Oak’s economic development director, said the company has plans to build a new 117,000-square-foot structure next to the current building. And in Waxahachie, Walgreens has a distribution center with less than 1,000 employees, according to the city’s economic development office. TSTC graduated its first group of Logistics Technology majors in December 2015. TSTC in North Texas will host a Registration Rally for the fall semester from 10 a.m. to 7 p.m. on Tuesday, Aug. 8. For more information, go to tstc.edu/rally. This entry was posted in North Texas on July 26, 2017 by Daniel Perry.